B-14A 1961 in Silver Tolex. This amplifier has a Jensen P12-Q speaker and what some would say is an oversized cabinet; it does, however, come with tremolo which requires two extra knobs, so perhaps that explains the larger cab. Though the tolex is indeed silver, the grille cloth on this and the other two B-14A models shown below is essentially early-to-mid ‘60s blonde Fender-style grille cloth somewhat spottily spray-painted silver – which gives it that distinctive transitional look! Another interesting feature about this model is the new-for-Rickenbacker slanted front control panel. Unfortunately, the control panel and all the interior hardware, including tubes and transformers, are mounted to a copper plate which is attached to the interior of the wooden case by two thin wire brackets. 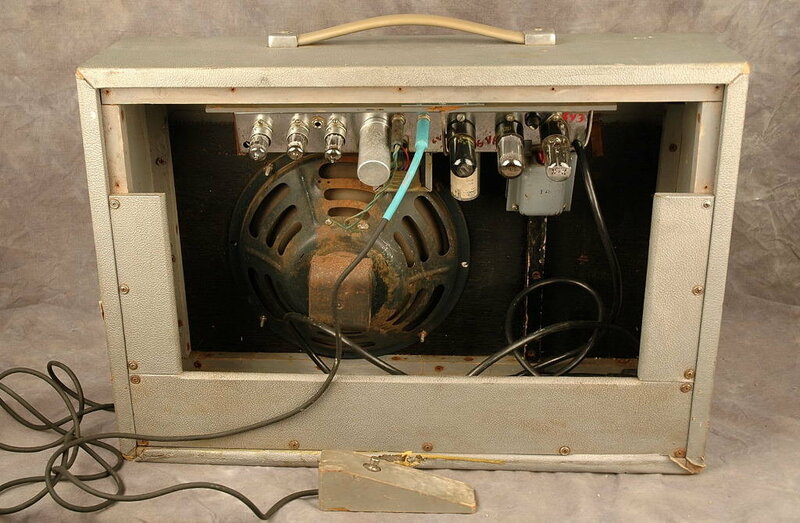 These amps do not travel well; one good jolt and the control panel may disappear into the speaker cavity. This particular example features its original “wooden wedge” footswitch for the tremolo function.